"The Ocean Course will be closed from July 7th until December 16th, 2009 due to Maintenance and Repair, We apologized for the invconveniences. And we remind you that our Arroyo and Mountain Courses are open and in optimal conditions"
Any discussion of golf in Los Cabos must begin with Palmilla Golf Club. Don Koll and Jack Nicklaus set the scene for the creation of this unique blending of desert and sea, one of the world’s truly picturesque golf destinations. Palmilla , now the One&Only Palmilla is the most classic of Mexican resorts in Los Cabos. The Arroyo Nine, the Mountain Nine and the new Ocean Nine are of traditional Mexican design. Golfers will surely like Palmilla Golf Course . 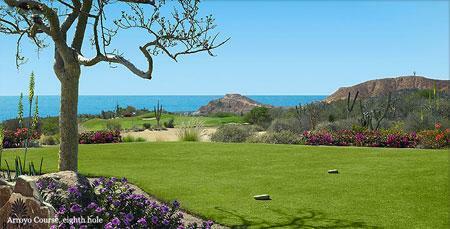 Palmilla Golf Course is very famous golf course of san cabo lucas and cabo areas. Find the exclusive facts, figures and information on "cabo golf website". "cabo golf website" Also provide Villas and accommodations information for Cabo Golf Vacations, find the suitable vacation homes suggested below and enjoy your golf vacation in Cabo San Lucas. The Ocean nine will be closed for renovations July 2009 - November 2009.
Credit card is required during booking to guarantee tee time. All rates are subject to change without notice. All rates above are including taxes. Rates are for 12 players or under; if more than 12 players please contact the Golf Shop for rates!! Green Fees include Golf Cart, Bottled Water, Bag Tag and Use of Practice Facility. Practice Facility - Palmilla Golf Club's practice facility has just been renovated, and now has brand new chipping and putting greens. Guests may use the driving range without playing for a cost of $20+tax per person. Rental Clubs - Callaway Golf rental clubs are available for men, women, and left handed players. Charge is $50+tax per set. Rentals include 2 sleeves of Callaway Golf Balls, X-22 Irons and Hyper-X woods. Casa Serena Del Mar is one of two very exclusive properties located at the foot of Palmillas beautiful beachfront and private golf course. The house is located in Palmilla Caleta which is one of three beachfront residential communities in the Palmilla area. Occupying two beachfront lots in Cabo's most exclusive gated community, Palmilla Caleta, Casa La Cascada is one of Cabo's true elite homes. The entrance from the street is unique with Hawaiian styled gates depicting Bird of Paradise flowers and foliage. The house has 4 bedrooms and they and the rest of the house is conveniently equipped with top of the line appliances and fixtures. The feel of the house is very much Mexican Baja, large rooms and open plan spaces help to keep the house cool and maximize the breezes off the Sea of Cortez. A modern hacienda of unparallel luxury, Casa Samuel reflects the beauty of colonial Mexico throughout its splendid grounds. An elite member of the Palmilla estates, this home enjoys the privacy and exclusivity the community is so renowned for. So aptly named, Villa Los Amigos Home of Friends is absolutely ideal for a group of friends or family members who wish to vacation together while also maintaining their privacy. Built hacienda style where each room is separate yet unified by an outdoor living area, Villa Los Amigos features classical Mexican architecture with archways and vaulted ceilings throughout. Dcor is warm and appealing and speaks of friendly gatherings.